Maybe one of the most expensive wedding dresses I have photographed. 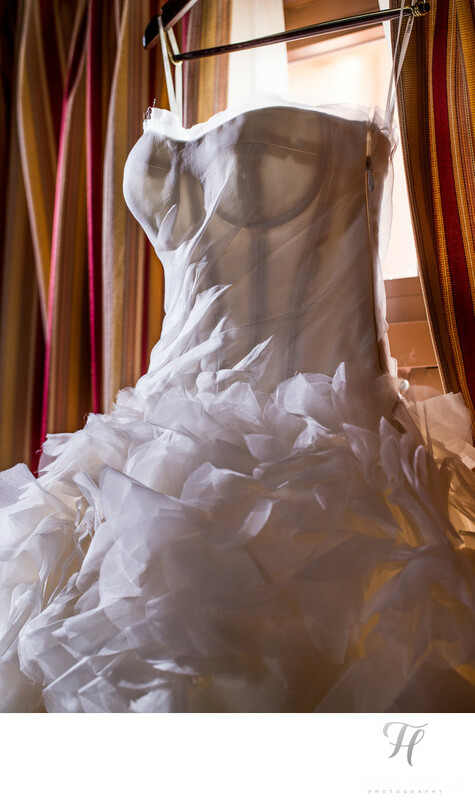 This $20,000 Vera Wang wedding dress was truly stunning. This shot, shows texture, dimension, and mood and of course a stunning dress. For all of the weddings that I shoot, I actually plan out the wedding day timeline (for photography) and when I do this I carve out plenty of time for the detail shots to happen in. To you (and most people) this is just a shot of a dress. But for the bride who paid this kind of money, she has expectations and wants to see all of the details. In this case, I have used some creative directional lighting to avoid "blowing out" any part of the dress. I am shooting on the shadow side of the dress, and using the off camera light to "rake" across the dress, to show all of the wonderful texture, and details. The background was not very important as "its all about the dress", (and generally with Biltmore Miami Wedding Photos it IS all about the background lol) for this shot tho, I pulled the drapes closed around the dress to prevent any other distractions and was selective on the position in which I captured it.